Your decision to pre-arrange is a noble decision, and it is an act that your family will greatly appreciate during their time of bereavement. Our caring and patient staff will walk you through the entire process. We will help you with selecting a cemetery lot and memorial, planning your burial, and any other special request you may have. Click Here for our Price List for Lots, Interments, and Columbarium niches. Making the arrangements for your interment is a way to make sound and informed decisions before death occurs, giving you and your family the peace of mind when the difficult time comes. Funeral planning is exhausting and difficult for the loved ones you are leaving behind, and planning your interment spares them of not only the added stress of making arrangements, but also the financial burden as well. Pre-Planning eliminates any anxiety related to making funeral arrangements, allowing them to begin to cope and understand their loss. By pre-arranging, it removes any confusion with your family interpreting your final wishes. When you pre-plan with the Monongahela Cemetery, we keep a detailed record of your burial instructions on file. When the time comes, it takes one call by a pre-designated family member to put your plans in motion exactly as you decided. 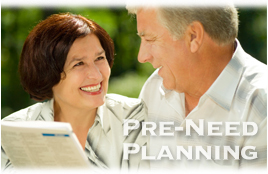 In addition to the emotional benefits, Pre-Need Planning is also a very intelligent financial decision. Purchasing your lot, memorial, and burial services in advance allows you to lock in all the costs associated with your interment, protecting you from inflation and rising costs. Every effort is made to ensure all costs are reasonable. We realize, however, that financial considerations vary from family to family. The Monongahela Cemetery nowaccepts Visa, MasterCard, and Discover.